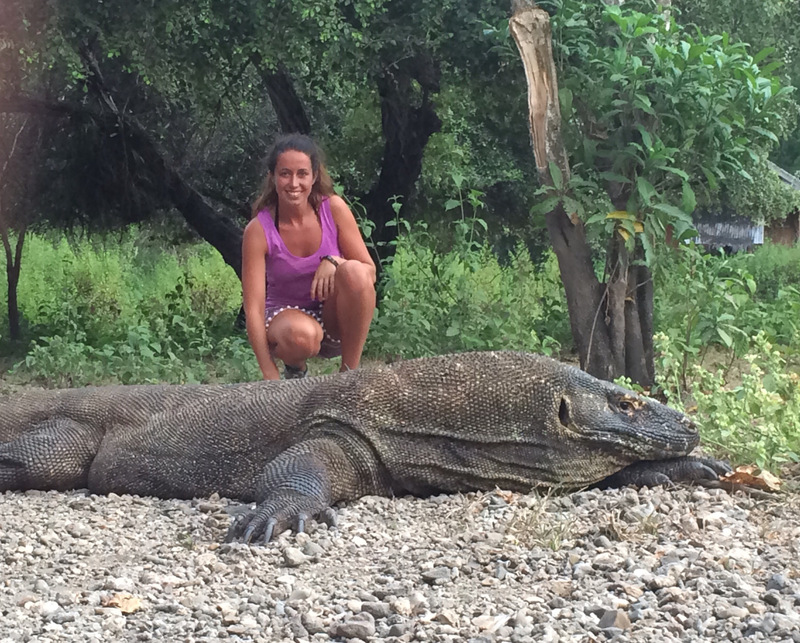 As a David Attenborough fan, I figured I couldn’t go all the way to Indonesia and not see Komodo dragons! I was a bit nervous because its not such a well-trodden path, but at this point I was with my friend Jordan so at least I wasn’t doing it on my own. 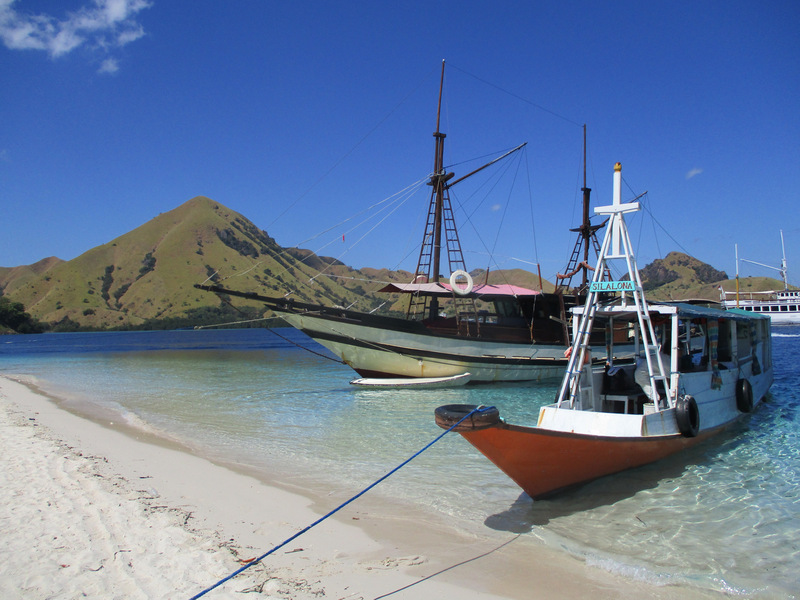 We booked a flight from Bali to Labuan Bajo, the gateway airport to the islands. Labuan Bajo itself was a very small town with not that much going on — just a few guesthouses and restaurants. 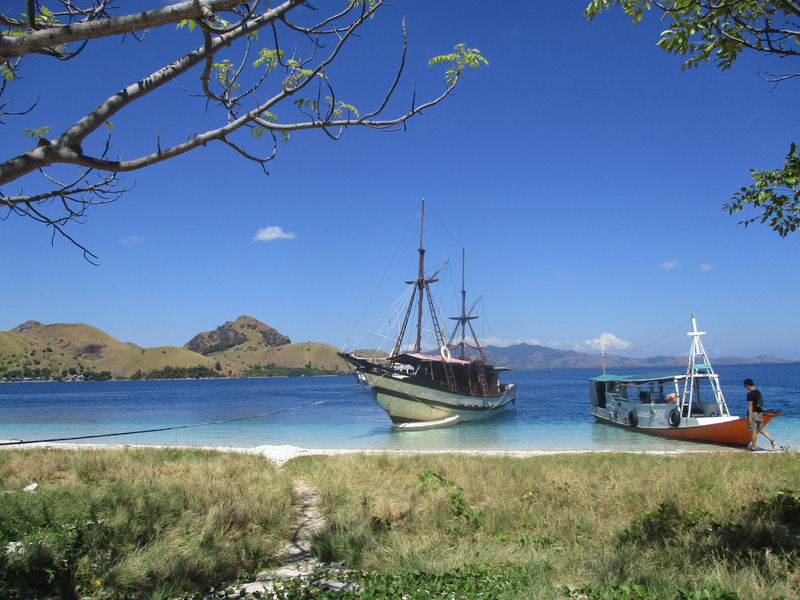 Once we’d found accommodation for the night, we shopped around for the Komodo island tours and finally found a really good priced trip — it was about £56 for three days, two nights on a big wooden sailing boat, with a company run by a guy called Mr. Ficko. I fully recommend not pre-booking a trip online nor going with the big names and instead shopping around — we saved ourselves about £60-£100! The following morning we walked down to the harbor to find our boat. Unfortunately, the actual big liveaboard boat had already started on its journey the day before, so Mr. Ficko’s team were going to take us and a few others out for the day on a smaller boat and then we were to catch up with the big boat the following evening. This little boat was very narrow and the engine so loud, we were grateful we weren’t spending all three days on this little one! Our first stop was Kelor Island, to have a swim and a snorkel. It was a gorgeous island, really clear seas and in the most idyllic setting, surrounded by rolling hills and small mountains coming out of the sea. After a little swim, we had a sunbathe and snooze on the beach. Our drivers for the day on this little boat were two Indonesian men who spoke absolutely no English. Unfortunately for us, they had got Mr. Ficko’s instructions wrong and took us next to the island of Rinca, which is one of the dragon islands we were meant to be visiting the following day. At this stage, we weren’t sure if it was us who had misunderstood, but we were aware that you pay an entrance fee and visit both parks in one day. So we got out the boat, registered, paid and were assigned a young ranger who was really funny. He spoke English incredibly well and kept cracking jokes. 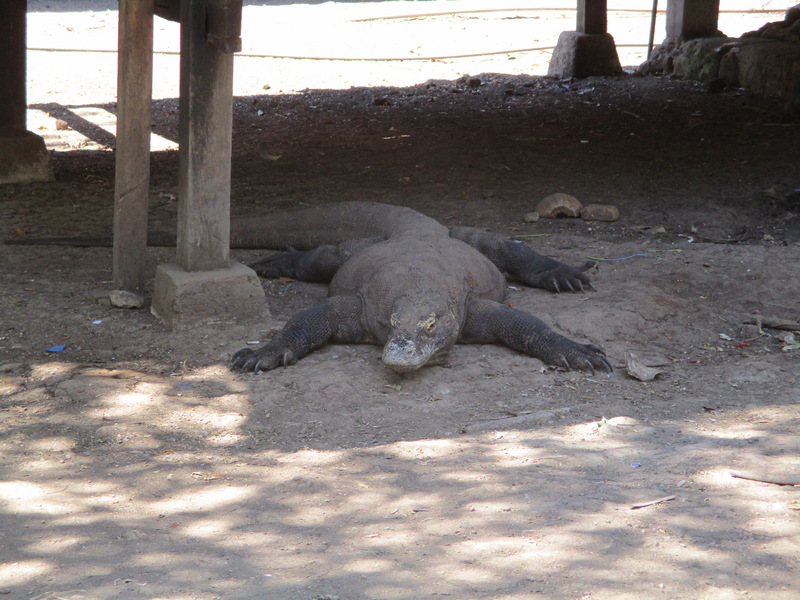 He guided us around as we took a short trek around the island and told us facts about the dragons. 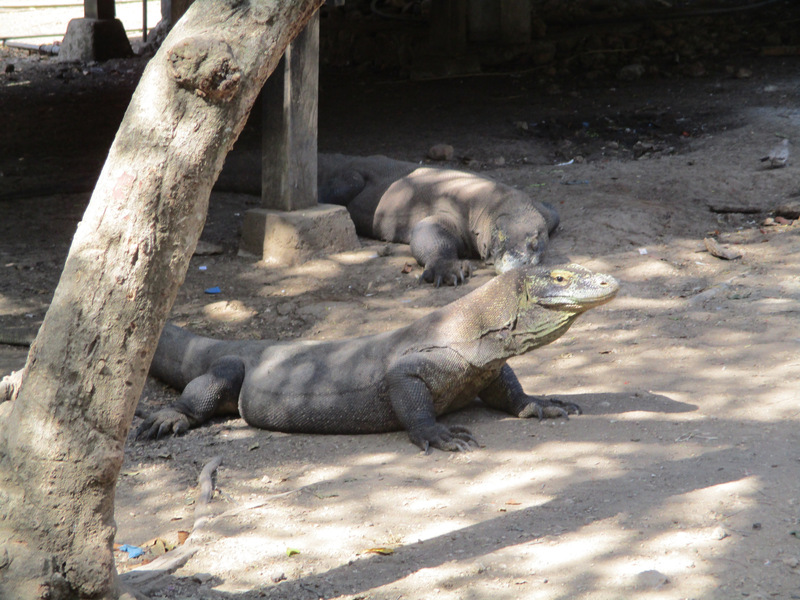 On Rinca Island, your chance of seeing dragons is higher but the dragons are smaller in size; on Komodo Island, your chance is smaller, but the dragons are bigger. 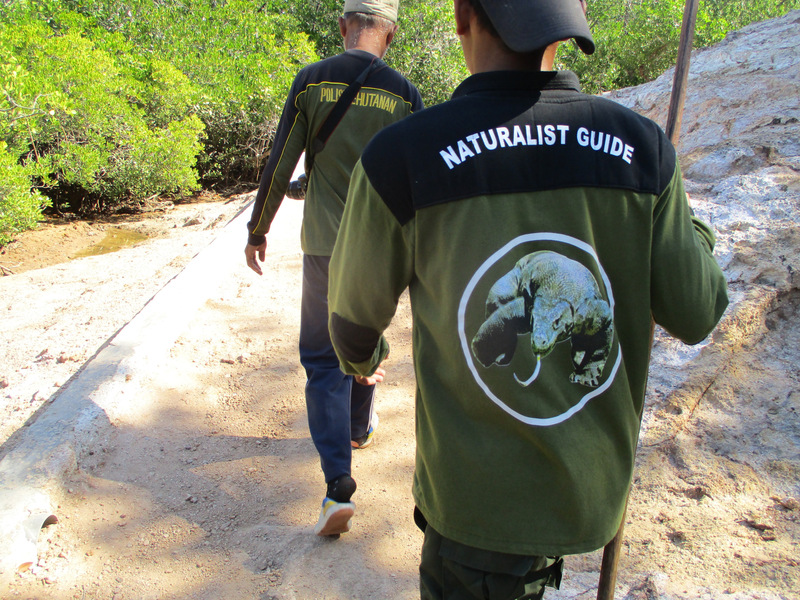 All of the rangers carry a long Y-shaped stick with them — this is in case a dragon comes towards the tourists, he will catch it by the neck and push back. As we walked around, the first one we saw was really small, but as we went along a bit further we saw some adults mostly lurking around the rangers’ huts because of the smell of food. 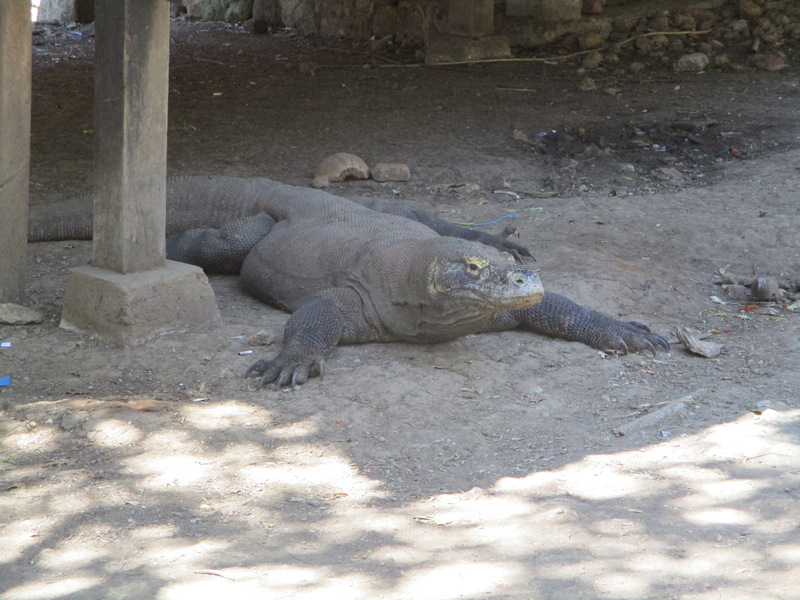 We also saw pigs and deer which largely make up the diet of the Komodo dragons on the island. When we boarded the boat again, expecting to be taken to Komodo to use the other half of our ticket, to be told there wasn’t enough petrol. After some angry phone calls to Mr. Ficko (not from me) we sailed to Kalong Island (Flying Fox Island) where we did some snorkeling. Genuinely it was some of the best I’ve done in my life there — the variety of fish was incredible! We saw the entire cast of Finding Nemo. We also saw some stingrays which was a bit scary. We then waited for sunset, when thousands and thousands of flying fox bats flew out from the mangroves to find food. It was really impressive! Our boat then made its journey to catch up with the big boat which we joined for dinner. We slept on the big boat, which left early the following morning. The boat was so nice, really big and we slept on mattresses on the deck. Annoyingly for us, the first destination on Day Two was Rinca Island for those on the boat who hadn’t already been. We just stayed on the boat and sunbathed — we didn’t mind because the boat was lovely and the views incredible. Once the others returned we then sailed for an hour to get to Manta Point. This was actually a highlight of the trip — to swim with the huge manta rays. The crew would wait til they spotted some and then dock and we would jump in the water. They were huuuuge, like two meters wingspan across and really graceful as they swam. We swam above them for hours as they swam around, feeding on smaller fish. It was really amazing, I only wish I had an underwater camera! After lunch we sailed to Namo, the pink sand beach, for another snorkeling session. It was a nice beach but it wasn’t pink as we were hoping for or expecting! Although when we jumped into the water and swam towards the beach, we saw the tiny red grains of sand, which make it pinker from close-up. 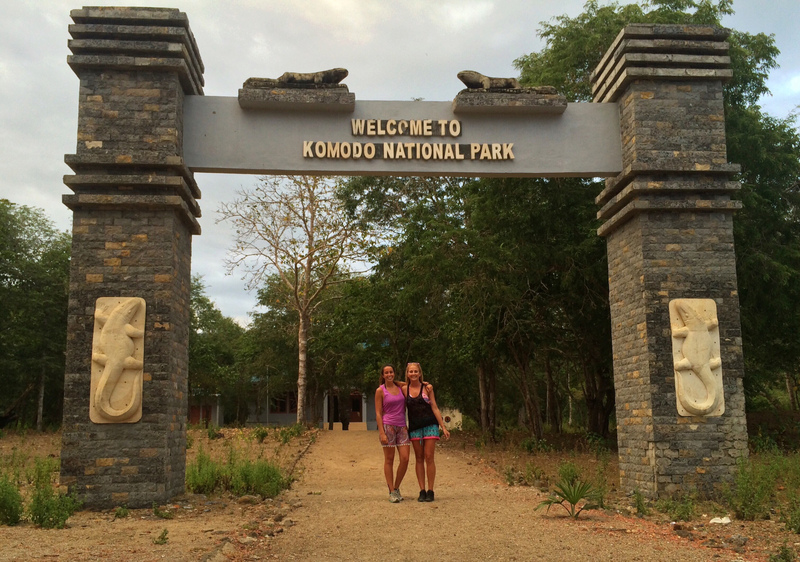 Our last stop for the day was Komodo Island. We weren’t sure if we could re-use our one-day entry tickets (we didn’t want to pay the fee again) but our Indonesian guide explained our situation and Mr. Ficko had given us a small refund for the mix-up. We just had to pay a tiny bit more and we were in! Our guide for this island wasn’t as friendly as the last one but when we did find some dragons, he took some amazing photos. Even though we look like we’re close to the dragons we are about 10 meters behind them with a ranger nearby! We docked for the night in Kalong Island again and watched the bats for a second time — it was incredible. After a stormy night (and restless sleep), the next day we were woken up in time for sunrise. 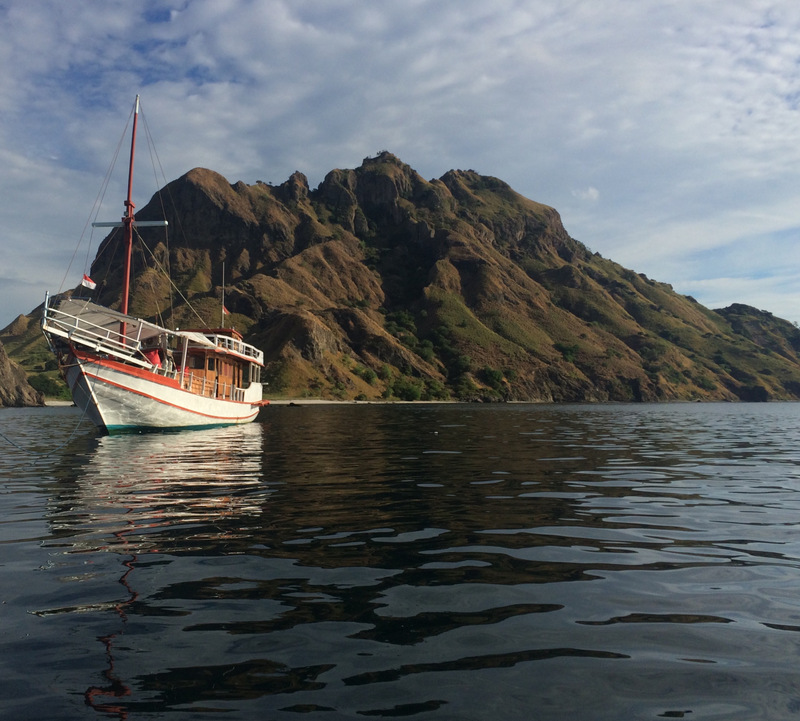 We were heading to Padar Island where we got off the boat to trek up to a viewpoint. It was hard — even that early in the morning it was already really heating up so we were sweating buckets. The view was a million percent worth it though. It was like something out of Jurassic Park — volcanic islands and turquoise coasts. Probably the best view I have ever seen — and the cover photo of this blog post! We made two more snorkeling stops that day. One featured some absolutely huge starfish, the biggest I’ve ever seen and the other, some little aggressive white fish. Even though they were tiny, they were scary! They literally swam straight up to your face if you accidentally went near them. There were a lot of underwater screams! 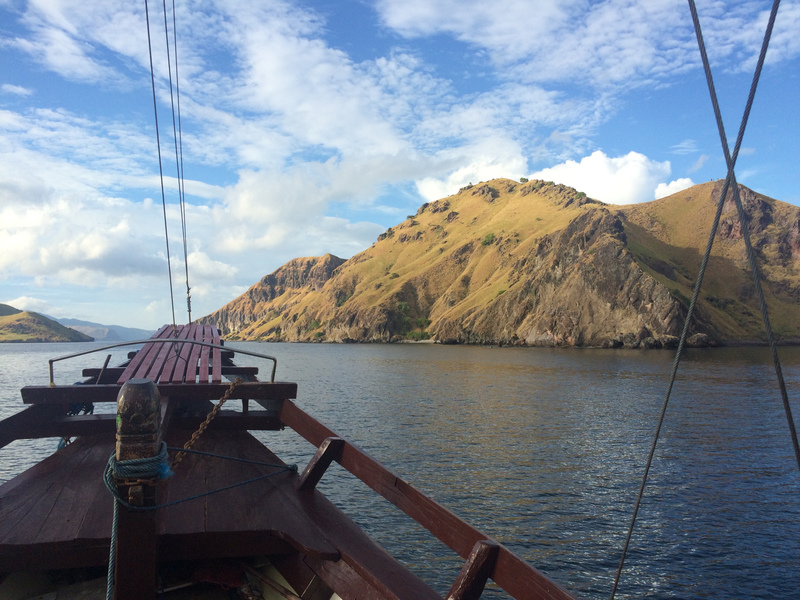 When back on the boat that afternoon, we sailed back to Labuan Bajo Town. We were sad to leave the boat as it had been the most incredible trip! The next group of people were coming on the boat that night, so we were told by Mr. Ficko and the crew that we could sleep the extra night in their own house before our flight out of Labuan Bajo the next day. This was really lovely because it saved us money on accommodation! We found some WiFi and had dinner, and then they drove us to their home. The boat was basically run by Mr. Ficko’s family and when off the boat they all lived together in that house. Our room was very basic, just a mattress essentially but so lovely that they shared everything with us; they were cooking salty fish and rice and kept offering us some even though we’d eaten. We sat outside and chatted to them until late and then in the morning they made us some tea. Indonesians are genuinely the nicest people I’ve met! I absolutely loved Indonesia and its people — I would love to spend longer and see more of it. 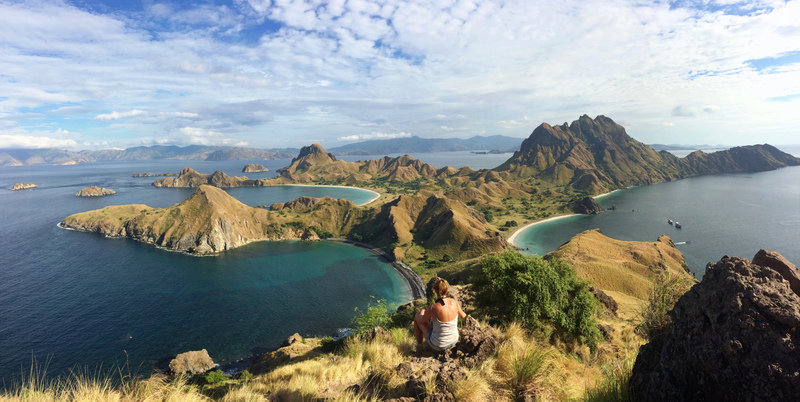 The Komodo Islands were insane; the scenery was stunning. I’ll have to go back! The first time I caught the travel bug was on a trip to Thailand back in 2013. In the last three years, over several trips, I have traveled around Thailand (twice), Cambodia, Vietnam, Laos, Australia, Indonesia, Malaysia, Borneo and Singapore, the west coast of USA and the Philippines. Later this year I am planning to travel around Central America and then South America. In the meantime, I’m at home in the UK saving up. Other countries high on my list to visit are New Zealand, Sri Lanka and India, and I’d also like to see more of Europe and the USA. 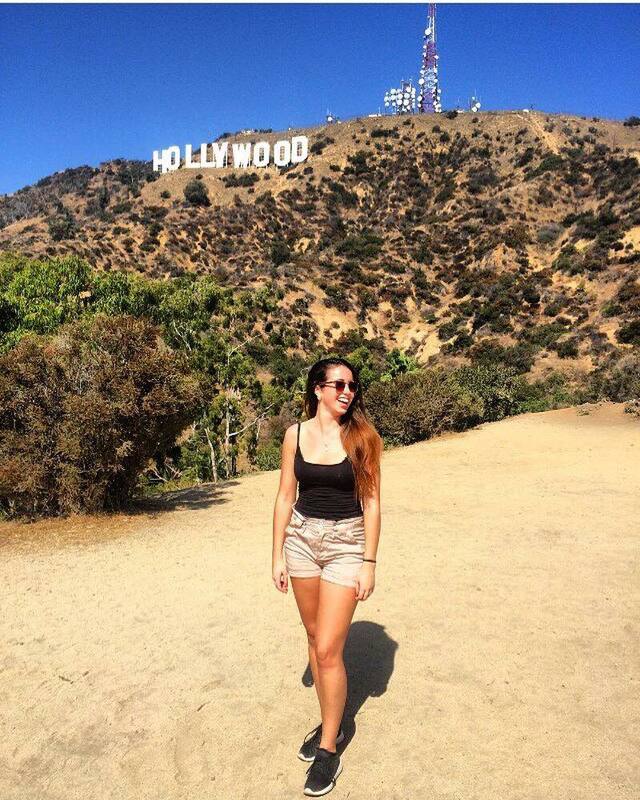 what an incredible journey Emily!! I really like reading your blog. Very easy to read and now I will have to go visit those Islands hehe.